So, you logged into your Facebook account on your friend’s laptop, or on a PC in an office conference room … and now you can’t quite remember if you ultimately logged out. Not good. Why? Because if you didn’t log out of that other PC completely, the next person who visits Facebook on that system may end up logged in as you, with complete access to your profile. 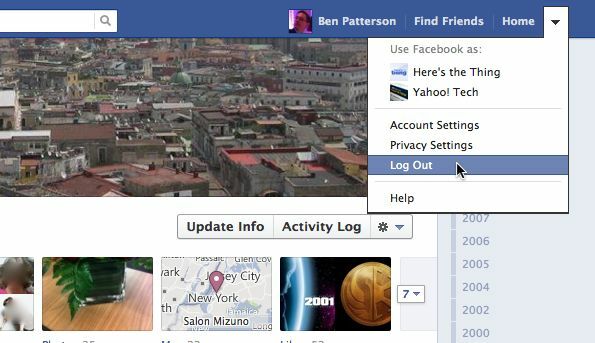 Luckily, it’s easy to quickly log out of any and all open Facebook sessions on any computer, whether it’s the Mac on your desk or a PC at the office. Sign into your Facebook account, click the downward arrow in the top-right corner of the page, and then select Account Settings. The first session listed (“Current Session”) should be the computer you’re currently using; beneath that, you’ll find a list of other open Facebook sessions, complete with approximate locations, times, and device types (such as “Safari on MacOSX,” meaning a Mac with Apple’s Safari Web browser). 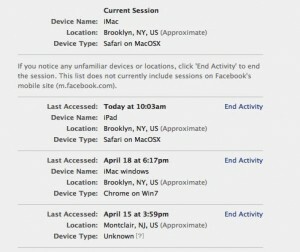 Take a look at the list; see any Facebook activity that look suspicious? Or did you spot the work PC that you used for Facebook but never logged out of? If so, click the “End Activity” link, and you’ll instantly be signed out of that particular session. Don’t want to take any chances? Then go ahead and log out of all of them. Another handy option I recommend is having Facebook send you a text or email message whenever someone using an “unrecognized” system tries to log into your account. Just check box next to “Send me an email” or “Send me a text message” under the “login notifications” setting. Have more questions about Facebook security? Check out my top tips for locking down your Facebook account—or just ask!